Dubai might have a reputation as one of the world’s most expensive tourist destinations, with its five-star hotels, enormous shopping malls and high-end restaurants. But did you know there is plenty you can see and do in the city without breaking the bank? Tucked away in the historical Bastakiya quarter, this fascinating museum is a caffeine fiend’s dream. After admiring the centuries-old grinders, roasters and pots, be sure to head upstairs, where you’ll find a cute little cafe serving up some of Dubai’s best coffees. You can sample a traditional Arabic coffee for just Dhs5, which comes with complimentary dates – so that’s a light breakfast sorted, too. 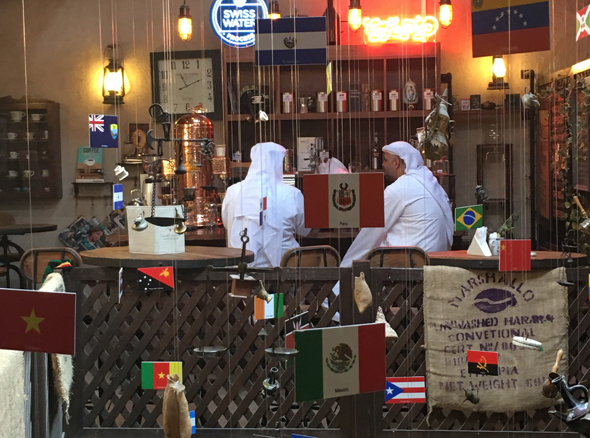 Dubai Coffee Museum, Villa 44, Al Fahidi Historical Neighborhood, Bastakiya, Bur Dubai. Saturday to Thursday 9am to 5pm, Fridays closed. Tel: (04) 353 8777. More info on website. 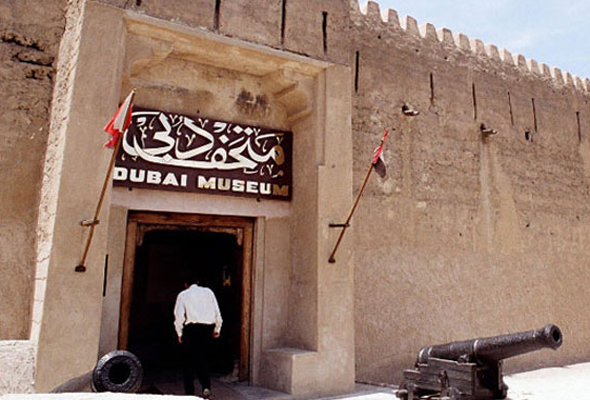 Long before the Burj Khalifa, there was Dubai Museum – and it remains one of the city’s most affordable attractions, with entry costing just Dhs3. Housed in Dubai’s oldest building (the Al Fahidi Fort was built in 1787), the museum skillfully chronicles the city’s incredible transformation from tiny fishing and pearling village to glitzy, modern metropolis. Plus, it must be one of the only museums in world with a sand floor. Dubai Museum, Al Fahidi Fort, Al Fahidi Historical Neighborhood, Bur Dubai. Saturday to Thursday 8.30am to 8.30pm, Fridays 2.30pm to 8.30pm. Tel: (04) 353 1862. More info on website. Legendary Iranian restaurant Al Ustad Special Kabab has been serving up its mouth-watering kababs since 1978, making it one of Dubai’s longest-running restaurants. The walls are covered with reviews from over the years, as well as photos of high-profile diners (Sheikh Hamdan is a fan). 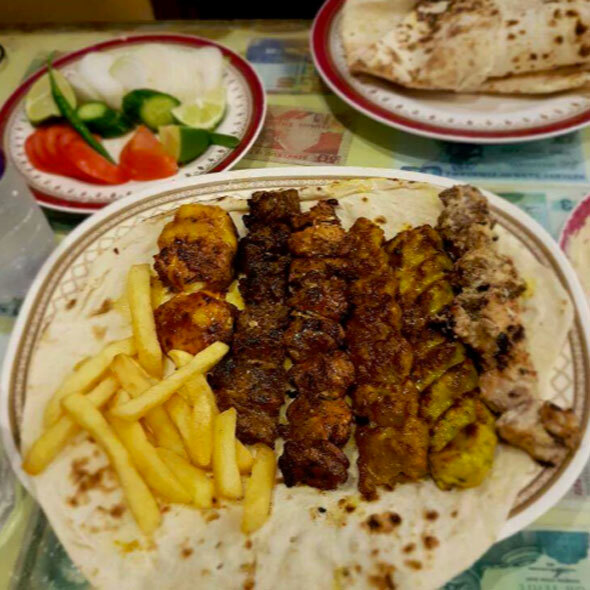 The ‘special kabab’ – a plate of buttery rice and juicy grilled meat – will set you back a modest Dhs30. Al Ustad Special Kabab, Al Mankhool Road near Al Fahidi Metro Station, Bur Dubai. Daily noon to 4pm, 6.30pm to 1am. Tel: (04) 397 1933. Forget the superyachts you’ve seen in the Marina – a Dhs1 abra ride is the best cruise in the city. 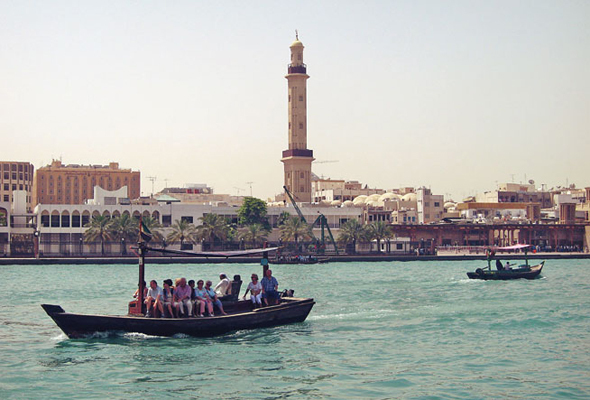 The Creek is the historic heart of Dubai, which once divided the city into two areas: Deira and Bur Dubai. Until the construction of Al Maktoum Bridge in 1963 – the first bridge in Dubai – the only way to get from one side to the other was in an abra. It’s still undoubtedly the most fun (and affordable) way across. Bur Dubai Abra Station to Deira Old Souk Abra Station, Dhs1. Daily 6am to midnight, boats run every few minutes. More info on website. Dubai is nicknamed the City of Gold, which doesn’t bode well for the budget-conscious traveller. But there’s always window shopping, and what better place to indulge your consumerist fantasies than at the Dubai Gold Souk? It’s home to the world’s heaviest gold ring, which weighs 58.686kg and is worth about $3 million. We found a slightly cheaper souvenir… a ‘golden’ statue of the Burj Khalifa, which we managed to haggle down to Dhs30. 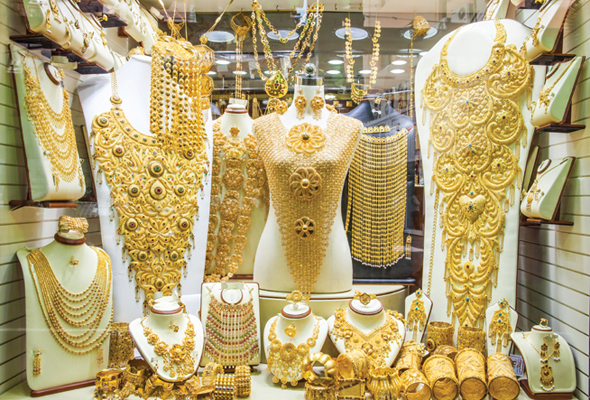 Dubai Gold Souk, Deira. Sat to Thurs 10am to 10pm, Fri 4pm to 10pm. 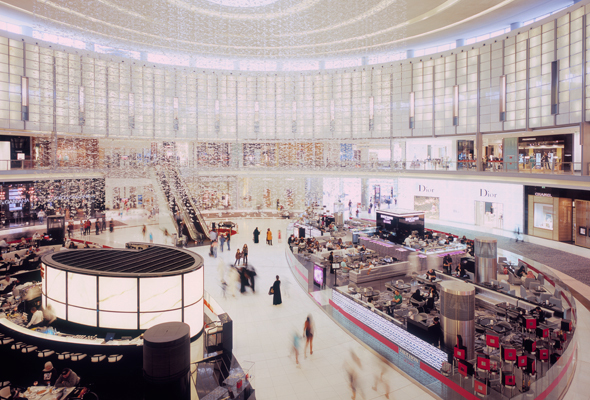 From the Gold Souk, keep things cheap by heading to Al Ras metro station and taking the metro to Dubai Mall for Dhs5. It might be the world’s largest shopping mall, but it’s also home to heaps of cool free stuff. Observing the marine life at Dubai Aquarium – one of the largest suspended aquariums in the world – will cost you nothing but time (we could actually spend hours watching the stingrays floating past). You can also check out Dubai Mall’s 155 million-year-old resident dinosaur, Dubai Dino. The Dubai Mall, daily 10am to midnight. More info on website. 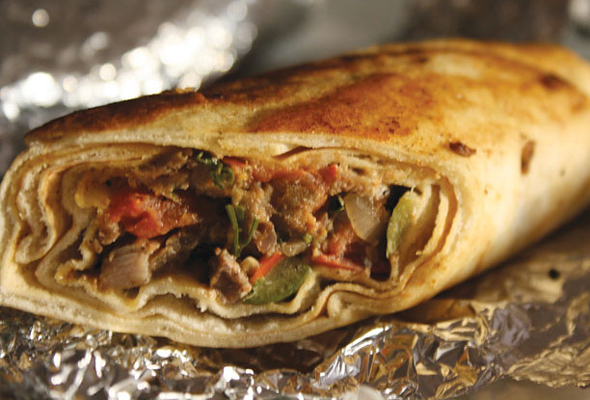 A trip to New York wouldn’t be complete without stopping for a slice of pizza, and Dubai’s shawarma is just as legendary. The classic cheap-eat consists of thinly-sliced meat, pickles, and fries stuffed into a soft pita, and all smooshed together to form a delicious sandwich. One of our favourite places to get it is Al Hallab, a Lebanese restaurant in The Dubai Mall – try and nab a seat overlooking The Dubai Fountain, and you’ll practically feel like you’re fine-dining. Al Hallab, The Dubai Mall, daily midday to midnight. More info on website.